Ugh, her breakdown was just horrendous! I'll never forget it. All the breakdowns I watched on live TV still haunt me. The ones I can never get out of my head are Ruffian, Timely Writer, Go for Wand, Prairie Bayou, and Eight Bells. I was also watching live when Mr. Nickerson had a heart attack. I still grieve the tragic losses of Landaluce and Swale. And now, I continue to mourn the loss of Mentor Cane. I wish this wasn't a part of racing but it's always there during every race I watch. It frequently makes me want to quit the sport too. But the upside doesn't let me get too far away from the sport I love. If the downside ruled, I never would have known the joy of watching the great fillies who are still with us. I watch the replays, never live. I have too many visions in my head of things I wish I had never seen. I do the same thing, Kathleen. I had just started watching again after Timely Writer when the 1990 Breeders Cup day came along. I haven't watched a race live since Go for Wand's breakdown. I got completely away from it for a long time. Oddly, what brought me back to following racing--online this time--was checking on Barbaro's condition. I love horses, but for the most part I hate racing. It's a strangely conflicted place to be, and I don't think I would follow it at all if it weren't for online communities like this one. Afleet Alex would be a great one to make a pedigree for. I was involved in racing in England in my youth I was a "lad" (that means someone who rides and grooms and goes to the track) I donate frequently from the proceeds of my pedigrees to the rescue of OTTBs. I also have one myself as well as 2 other horses in their 20's. I feel that that the tragedy of racing is horrible, but that the horses are treated mostly very well indeed. There are also accidents in all the other horse sports, but they are not in the public eye in quite the same way. Afleet Alex would be a good horse for one of your pedigrees, Marlane. I like that you're involved in helping OTTBs, and my expression of my own reaction to tragic breakdowns isn't intended as a criticism of anyone else who processes things differently. Your pedigrees are lovely. I wish you luck with them. Thanks so much I have been researching and making pedigrees for a few years now, in fact for over 10 years. I wanted more people to know about them and what I do hence the joining of this forum. I have made close to a hundred at the moment. You are certainly entitled to your opinion. There are a lot of people who do not understand how race horses are treated because they have not been behind the scenes so to speak. It certainly is controversial. But I feel that if a horse is going to take part in a sport it is a noble one. The part that I have trouble with is when a horse does not do well and is discarded with no respect for the magnificent animals that they all are. 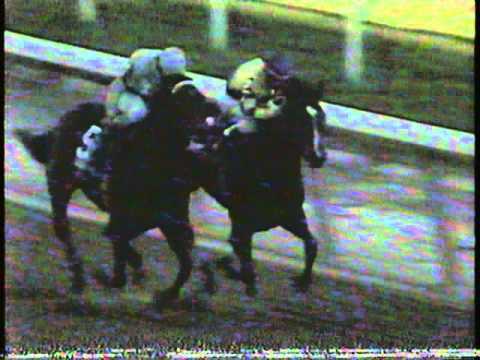 The 1990 Breeders' Cup Distaff race...Go For Wand vs Bayakoa. Sorry if this brings back very sad memories, but I've never seen this race before. While innocently researching for races/images of Bayakoa for Golden Girls, I came across this iconic race tragedy. Warning for those who haven't seen this race...I wasn't expecting what I saw...it made my heart stop. For those of you who remember this race well, please skip this posting. A truly remorseful Ron McAnally, Bayakoa's trainer said after the race: "I have mixed emotions...I can't cope with something like this. I feel good about our filly, but for the other filly (Go For Wand)....Ah...It's terrible for her, terrible....To have a great filly like this, on a day like today, it's sad, it really is a sad situation...as my wife said...they give their lives for our enjoyment". I was on the track, training one morning when a break down happened. It was the second time I'd been up to the track, I was still pretty young I think about seventeen at the time and I was doing pony work for some extra money. I was out with a horse and an old, grizzled, been around the track since time was born, exercise rider (Zenyatta's Steve reminds me of him) on a young thoroughbred. I never got his name (you may pick up names if you pony regularly but I was just catch pony-ing for this trainer) and we were working clockwise (or backwards) on the track, gearing up to turn and this horse was suppose to break off from me and breeze home. We were on the backside and the breakdown happened down near the finish line, right in front of the gap where you come in and out. We had gone out late, so there were only a handful of horses on the track. Well this exercise rider and I had been pretty much all business up till then, not talking much but I guess he saw in my face that I had no idea what I was supposed to do. Here I was, pony in one hand, handful of cranked up thoroughbred for a trainer/not mine in the other. Obviously, we weren't going to turn and break off for the work but should I continue to canter us around and get off the track or what?? He walked me through it. We stopped, still on the backside of the track, across from where the break down happened and we worked a figure eight circle to now 'warm down' the young thoroughbred he was on and keep that horse calm and focused, while matters were attended too. In this instance, "matters" involved on the track euthanasia and removal. He explained what was going to happen in blunt but direct words and he explained what we were going to do, in order to stay out of the way. He further educated me on the 'track code' for when you're out and these things happen. But after the education was over he kept talking to me about all sorts of just small talk questions and diversion techniques and just all manners of horsey stuff. I realized, after it was all over and I was putting my pony up that he'd calmly distracted me through the whole, horrible event so I never really did witness the gruesome details. What tracks did you work at? Penn National, Atlantic City, Laurel and Charlestown. Do you still do it? Have been to backside at Charles town, Bowie, and pimlico. Have a couple of friends who used to be trainers and have watched early morning breezes as well as a couple of gate trainings, as well as horses in paddock before race. Never did what you did but had dreams as young girl owning breeding farm. Use to draw maps for such a farm. I used to draw maps as well, got into it after read The Black Stallion's Filly. Remember it had the map of Hopeful Farm in it? I do not. I hung up my riding boots when I got pregnant and then had to retire my boy due to the arthritis in his knee.